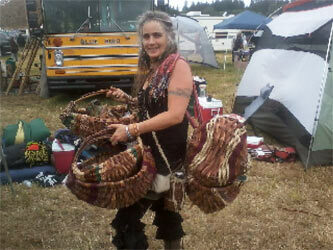 Katrina is a mother, artist, herbalist, basket weaver, dancer, and lover of life. She learned to weave baskets in 1991, and has been joy-fully weaving ever since. Her love for plants and gardening has been woven into her basket adventures. As she learned about local weaving plants, she planted them at her home and elsewhere to propagate nature’s weaving wonders. Katrina has two children and has been weaving for 20+ years, and has devoted her energy to creating a home-based business. Visit her website. Her love for sacred plant allies and herbs has led her to medicine making. She is also a beekeeper, and is in flow with the season’s energies, as she sows seedlings, nurtures plants, harvests, weaves, and teaches, as well as spending lots of time doing African inspired dance. Katrina is also a co-producer of The Goddess Crafts Faire—a local faire that features women artists and performers in Sebastopol, California. She has been an artisan at this faire since the first annual, (20 years) and has been involved in the production of this event since 2005. Katrina currently lives in Willits, Ca.